Thomas Newcomen Corry Burnett*, was born in Abbeyderg on the 24 August 1896, and was the youngest son of Samuel and Catherine Burnett. Prior to the war, he was working in Ballinasloe, Co. Galway as a shop assistant. 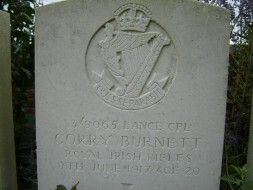 Burnett, Thomas Newcomen Corry; L-Corpl., the Royal Irish Rifles, yst. s. of Samuel Burnett, Renagh [sic], co. Longford, Farmer, by his wife, Catherine Louisa, dau. of Joseph Corry; b. Abbeyderg, Kenagh, 24 Aug. 1896; educ. 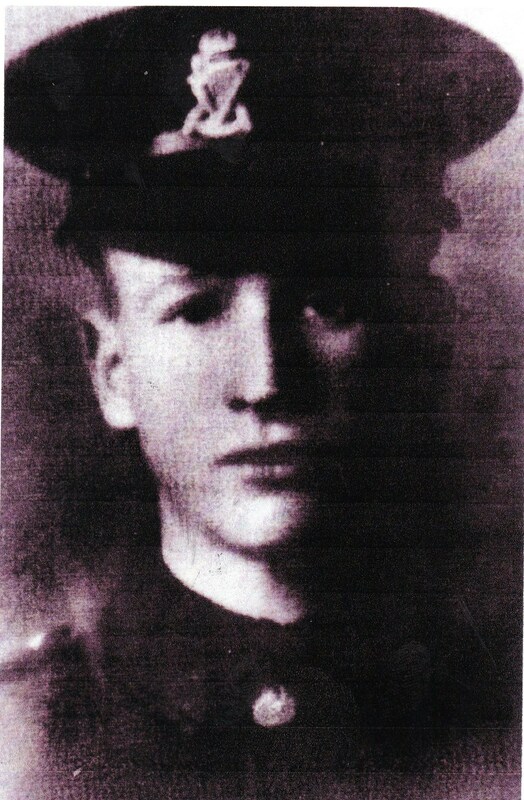 Kenagh National School; as a Shop Assistant; enlisted 15 Nov. 1915; served with the Expeditionary Force in France from 20 July, 1916, and was killed in action at Messines Ridge 7 June 1917. Buried in a Military Cemetery there. His colonel wrote: "I know I have lost one of the best, and it may be some small comfort to his mother to know how proud we are of him." and the Chaplain: "He was highly esteemed as a brave and efficient soldier." Thomas is commemorated in a Great War memorial erected by the people of Kenagh in July 2016 to those from the area who died in WW1; he was also commemorated in a memorial to those from the Carrickedmond parish and area who died in WW1, erected by the community there in June 2017 and is located in the village of Tashinny. Thomas's sisters, Lillie and Pearl served as Red Cross nurses during WW1. Son of Samuel Burnett and Catherine Louisa (née Corry*) of Abbeyderg, Kenagh, Co. Longford. Thomas's sister, Alice, was a nurse in Belfast and is listed as the contact relating to his Commonwealth War Graves Commission (CWGC) memorial. *Civil records give his mother's surname as Curry, in his and his sibling's registration of birth.